This amazing 1 oz South African Krugerrand Gold Coin is one of the most popular coins on the market. Dating back to 1967, this coin was also the world’s first modern bullion gold coin. 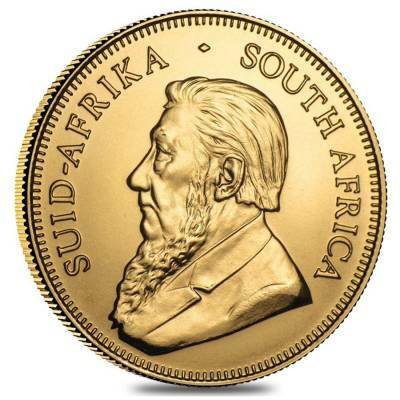 The concept of the Krugerrand was first introduced by the South African Chamber of Mines in the 1960's to promote physical gold as an investment opportunity for the "man on the street". The Krugerrand was released in 1967 as a legal tender coin and contained 1 troy ounce of fine gold. This gold coin was unique in that it had no denomination because its face value was connected to the daily gold price. The Krugerrand was mass produced so that it could be sold at a relatively low premium over the current gold price. In 1980 the fractional Krugerrands (1/2 oz, 1/4 oz, and 1/10 oz) were released, making the Krugerrand affordable to more people. The designs on the coin are well-recognized all over the world hence they are easy to trade and liquidate. The obverse features a profile portrait of Paul Kruger, designed by Otto Schultz, and the reverse depicts the Springbok antelope, a national symbol of South Africa, created by Coert Steynberg. Made from .9167 fine gold with a weight of 1 troy ounce. Struck by the South African Mint. Year of mintage vary based on our available inventory. Legal tender of South Africa. Individual coins are sold in plastic slips. Lots of 10, 15, 20, and 25 come in plastic tubes. Obverse: Features a left facing profile portrait of former South African president Paul Kruger, a design by Otto Schultz. Inscriptions - “SUID AFRIKA” and “SOUTH AFRICA”. Reverse: Depicts Springbok antelope, a national symbol of South Africa, a design by Coert Steynberg. Inscriptions - “KRUGERRAND,” year of Mintage and Gold weight. Bullion Exchanges offers you a great selection of exclusive items from renowned international refineries. Add this amazing coin to your collection today, and it will be carefully packaged and delivered to your address. If you have any questions, just call us at 800.852.6884, or send us a message, our customer service representatives will be happy to assist you. These beautiful coins shipped incredibly quickly. All five Krugerrands arrived in perfect condition due to well packaging. Very pleased with service!!! I recommend shopping with Bullion Exchanges, as always I am 100% satisfied with my purchase and the service I received. If you have yet to purchase the prospector coin, you're missing out! Arrived perfectly, looked beautiful. Couldn't ask for a better transaction. The coin is beautiful and a great investment. Excellent customer and shipping Bullion Exchanges! This beautiful coin looks better in person and the fact that it was packaged with the utmost care really showed me how amazing the coin was. Fast and careful shipping. Krugerrands are a classic must-have. My piece was in very good packaging and looks high-quality. Thanks! For passionate collectors! Very unique design! Thanks for quick and free delivery! The coin is intact in its packaging and looks great. This 1 oz South African Krugerrand Gold Coin came in perfect condition! It looked untouched received order next day. Bullion Exchanges made the typical hassles of online ordering quick and easy! I got my South African Krugerrand Gold Coin super quick and in great condition! I'M LOOKING FORWARD TO MY NEXT PURCHASE FROM BE!!!! Always fast and free (discreet) shipping. Thank you once again! With this purchase, you earn 1292 Bullionaire Bucks 1292 BB = $1.29. We currently have 918 of this item in stock. For every $1 spend, you will earn 1 Bullionaire Buck which is equivalent to $0.001 off a future purchase. 1292 BB = $1.29.